McIntosh marks 70 years with £25,000 Limited Edition Commemorative System | What Hi-Fi? 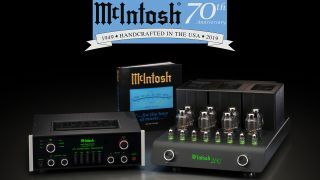 McIntosh is 70 years old. Well, nearly - 2019 marks its 70th year. And like an excited kid with a birthday approaching, it’s already thinking ahead to the occasion in the weeks before. The US electronics brand (founded in 1949, if you couldn’t be bothered to do the maths) is marking its anniversary with a £25,000 Limited Edition Commemorative System. The system comprises two new audio products: the MC2152 70th Anniversary vacuum tube amplifier and the C70 70th Anniversary vacuum tube preamplifier, as well as a “…for the love of music…” McIntosh History Book that contains a certificate authentication. Only 70 Commemorative Systems are being produced – only one is coming to the UK! – and each system’s two components are marked with matching serial numbers. There's a charitable cause, too. For each system sold, McIntosh will donate $1,000 to global humanitarian organisation Save the Children, which will be celebrating its centennial year in 2019. The MC2152 150-watts-per-channel stereo amp uses eight KT88 output vacuum tubes, as well as eight small signal tubes: four 12AX7A (for the balanced and input amp stages) and four 12AT7 (for the voltage and driver sections). LEDs under each of the smaller tubes can be set to off, green or blue - the latter exclusive to the MC2152. McIntosh's patented Unity Coupled Circuit output transformer technology, which harks back to the company’s foundations in 1949, has been designed so that the amp can feed its full output to almost any pair of speakers regardless of their impedance. Contained within a matte-finished aluminum chassis with carbon fibre side panels and a black-powder-coated-finished stainless steel wire cage for the vacuum tubes, the MC2152 features both balanced and unbalanced inputs, in addition to a dedicated input and output that will automatically power connected McIntosh components on and off. As for the C70 preamplifier, it has been aesthetically designed and engineered to match its counterpart. There are six vacuum tubes (one 12AT7 and five 12AX7A), seven inputs (two balanced inputs, three unbalanced, one MC and one MM) and two pairs each of balanced and unbalanced outputs. It too can automatically power connected McIntosh kit, and a 6.3mm headphone jack powered by McIntosh's High Drive headphone amplifier completes the list. Control knobs and rocker switches cater for, for example, bass and treble alterations; impedance and capacitance adjustment for phono inputs; the relative volume balance between the left and right audio channels; and switching between mono and stereo modes. Orders for the £25,000 70th Anniversary Limited Edition Commemorative System can now be placed with authorized McIntosh dealers, with shipping expected to begin in December in the US, and early 2019 in the UK. Once, the 70 packages are gone, the MC2152 70th Anniversary Vacuum Tube Amplifier and the C70 70th Anniversary Vacuum Tube Preamplifier will be available separately for £16,000 and £9000 respectively.